While there are a multiplicity of factors contributing to the decline of Irish aquaculture production , some of the key challenges facing the sector include (i) increased production & operational costs, (ii) the cost of meeting ever-increasing environmental compliance & regulatory requirements, (iii) and under-investment within the sector. It was against this backdrop of sharp decline in the freshwater sector that the Department of Agriculture, Food & the Marine (DAFM) elected to support a programme of research to identify the necessary scientific and technological supports to assist the sector meet and exceed growth targets. Out of this, the MOREFISH programme was developed. MOREFISH comprised of a multidisciplinary team of engineering and scientific expertise from the National University of Ireland, Galway and Athlone Institute of Technology, industry stakeholders, policy-makers and commercial operators to respond directly to critical technical and policy gaps identified by stakeholders and the 2014 DAFM research call. 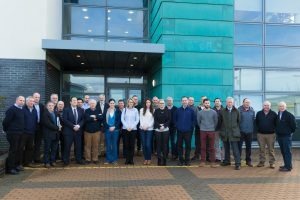 The aim of the programme was to develop and test innovative technologies and novel production processes to significantly improve production output, operational efficiencies and management at inland aquaculture sites in Ireland. Achieving these goals was also necessary to reconcile the contrasting demands of the growing national aquaculture industry with meeting the goals of the Water Framework Directive . MOREFISH ran from January 2015 to August 2017. A key success of MOREFISH programme was been the formation of an independent platform which can act as a scientific repository for the industry, and provide a forum for the industry to establish proactive engagement among all stakeholders, thereby supporting the sustainable development of the industry (Image above).